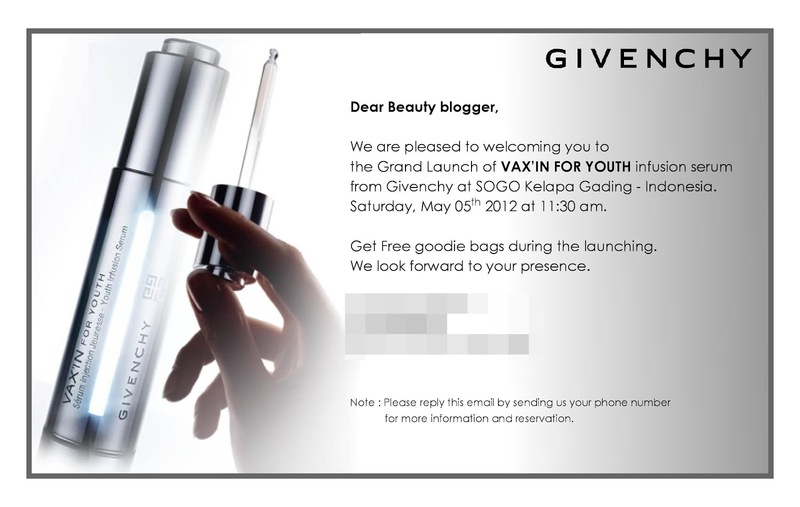 Hello, lovelies~ A few weeks ago, I got an invitation from Indonesian Beauty Bloggers in my email to come to the Givenchy beauty event at SOGO Kelapa Gading mall (which happens to be my favorite mall, fyi) on the 5th of May 2012. Wow, that was a long sentence, wasn't it? Givenchy Indonesia just launched VAX'IN, a serum that helps the skin to combat aging by strengthening its own defense system and intensifying its repair system. It targets women who are 25 years or older and is suitable for all skin types. It claims to help the skin produce more age-defying proteins. The serum helps to prevent and slow down further signs of aging with its creamy texture and non greasy or sticky finish. My skin felt soft, smooth and velvety after using this on my hands. We were directed to the Givenchy counter in SOGO Kelapa Gading mall and were welcomed to a skin consultation check or a makeover. At the counter, they have skincare, makeup, and perfumes, so there is something for everyone. Carnellin was the first blogger who did the skin check as the rest of us gawked at the makeup products. I had been eyeing their mascara, Phenomen'eyes because Wayne Goss talked about it in his videos and how he LOVES that mascara. I don't really wear mascara on a daily basis, 3-4 times a week maximum, that's why I've been considering whether or not to get it (I bought it in the end. Bad Phanie!). One of the things that interested me was the Prisme Libre loose powder, which is a four colored powder that when combined will help set the foundation and make the face look more flawless. Although it may look like an array of colors, it will turn translucent once blended properly on the face. I tried it on my hands and it gives a fine texture to the palm of my hand, without all the colors of green, pink or blue. A little while before the event ended, each of us were given a Rp 200,000 voucher. I was torn between choosing a foundation or THE mascara. However, I opted for the mascara at the end because I just bought a foundation a few weeks ago. I am still eyeing their PHOTO'PERFEXION LIGHT, so maybe that will be another review post someday in the future. LoL. Before the end, we were given a goodie bag and took a group photo in front of the Givenchy counter. It was a lovely Saturday and I hope to meet you all again very soon. I read about this serum in a magazine and it sounded really nice but it was pretty expensive. 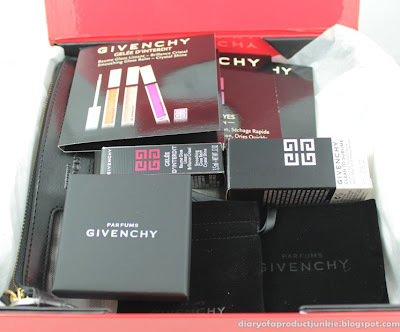 I would also have chosen the mascara (or the Prism powders) - the new breed of Givenchy products are really interesting!